As you may recall, I have made a resolution to read more books by ladies and people of color this year. 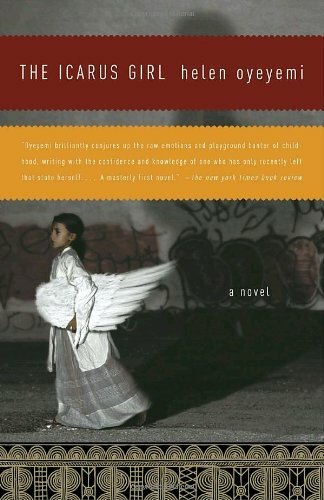 While I was waiting for my shipment of lady books to come in from Powell’s, I dug through my to-read shelf to see if there were any acceptable options hiding in among all the white dudes, and I came up with The Icarus Girl by Helen Oyeyemi. And oh boy. What a wonderful and terrifying book this is. I have lots of thoughts about it. Let’s go. The Icarus Girl is the story of Jessamy/Wuraola, the daughter of a Yoruba Nigerian woman and an English man, living in England. She has trouble socializing, which manifests in a number of behavioral problems, so her mother decides to take her to visit Nigeria to reconnect with her roots and her family there. Instead, she connects with TillyTilly, a local girl who turns out to be less a girl and more a terrifying mythological creature bent on taking over Jessamy’s life. Seriously, this book is so scary. I’m not a person who is easily scared by books (see: that time I read Haunted), so when I say that this book literally made me jump and huddle a little bit under my blanket and reconsider sleeping for the night, understand my full meaning. This is not a book you read after lights out. Also don’t read it in public unless you are A-OK with strangers seeing you make horrific faces (which, for the record, I totally am). 1) Icarus Girl makes use of Yoruba folktales rather than a vague, made-up magical world, so the logic of it feels more consistent. TillyTilly herself is changeable and vague, but the boundaries in which she exists are always clearly defined, so watching her slowly expand them is far more terrifying than not knowing where her limits are. 2) Because TillyTilly is Jessamy’s age, instead of an adult, the struggle against her feels more like an equal battle than the standard kid-vs.-adult narrative. TillyTilly is terrifying in part because Jessamy relates to her so much, when she has no one else to relate to. 3) There is nobody who can save Jessamy but herself. Ocean at the End of the Lane pretty clearly gives the narrator a number of allies stronger than himself to help protect him at the outset of the story. Jessamy is on her own, for the most part. The adults who try to help her don’t understand what’s really going on, and the one who can help her is too far away to see the problem. Watching a character fight a battle themselves is endlessly more engaging than watching one get saved a few times. I didn’t mean for this review to turn into Why-Icarus-Girl-Is-Better-Than-Ocean, but the whole time I was reading it, I couldn’t help thinking how frustrating it was that two books could be so similar, and the inferior one get so much more attention. Icarus Girl is lovely and scary and carefully plotted, though a bit slow in places, and you would need a shovel to dig through all the rich thematic material. In short, if you like terrifying young adult novels or fairytale adaptations or The Ocean at the End of the Lane, this is definitely a book you should read. But with the lights on. Like, every light in the house. P.S. Though, I’m not sure about the title. I mean, I get that Jessamy flew too close to the sun with her relationship with TillyTilly, and flying comes up a lot thematically, but a Greek myth reference for a British/Nigerian folktale adaptation? Really? P.P.S. Also, Oyeyemi was a teenager when she wrote this novel. What am I doing with my life. I read this book when it first came out, and adored it (I also read one of the author’s other novels, White is for Witching, and it was excellent as well. Although I found White to be scarier, so be forewarned). I never would have thought to compare it to Ocean, but maybe that’s because I read them a different times and so I don’t associate them. As to the comparative hype–I think Gaiman once said something to the effect of “At this point in my career, I could publish a pornographic cookbook and have the publishers leap at it.” I’m sure a lot of it has to do with name recognition/relative output. Yeah, Gaiman definitely has the kind of name recognition that automatically generates media hype. I just like to complain about it because I think he’s kind of over-rated (though still pretty good, and I don’t feel I really get to have an opinion about him until I’ve read Sandman, so take that with a grain of salt). I read Ocean only a few months ago, so it was fresh in my mind for the comparison. I have not heard of Yoon Ha Lee, but she is going on my list of authors-to-read. Thanks for the rec! Weirdly enough, I’ve never read Sandman (couldn’t get over the art–headache-inducing) but the non-Gaiman Lucifer spin-off is one of my favorite series. Pingback: Unlikable books: White is for Witching & Foxfire | Curses!! Books!! !